When you sell something through eBay, Gumtree, Depop or even Bump it’s essential that you choose a safe way to receive the funds. However, fraudsters have created another scam to make people think that the funds are safe, so they send the goods, but they are not and the goods disappear. This week we helped someone about to send £200 trainers to a fraudster that hadn’t paid. 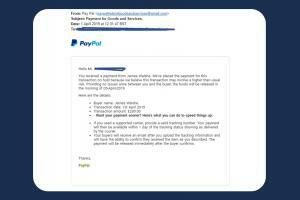 The scam works by the fraudster suggesting using PayPal goods and services service, this is a great service to protect buyers and sellers, however the fraudsters send a fake email to the seller telling them that funds have been received when none have been sent. In this case the seller would have lost the £200 trainers. The email as you can see below is very convincing but means nothing. 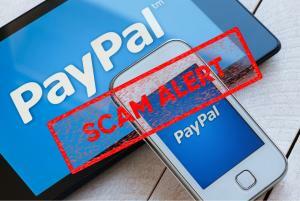 The PayPal goods and services service is great but read on to use it safely. According to Experian ecommerce fraud grew by 30% last year. Only send to PayPal address – as a seller you lose the PayPal protection if you send the goods to a different name or address than the buyers PayPal account, so only send to those!